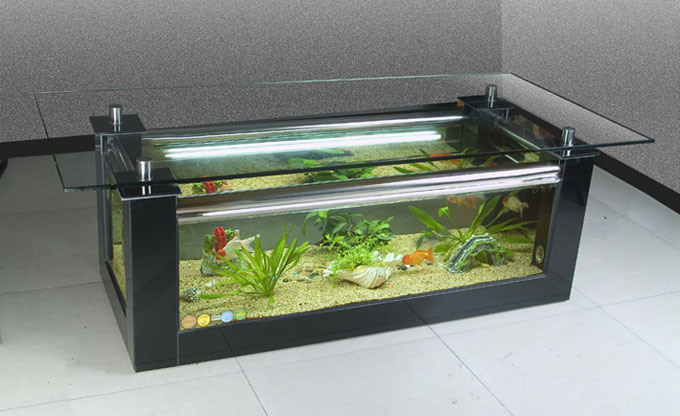 There are some amazing coffee tables out there that I would love to own and have in my front living room, but none much better than this one with a full on aquarium built inside of it! 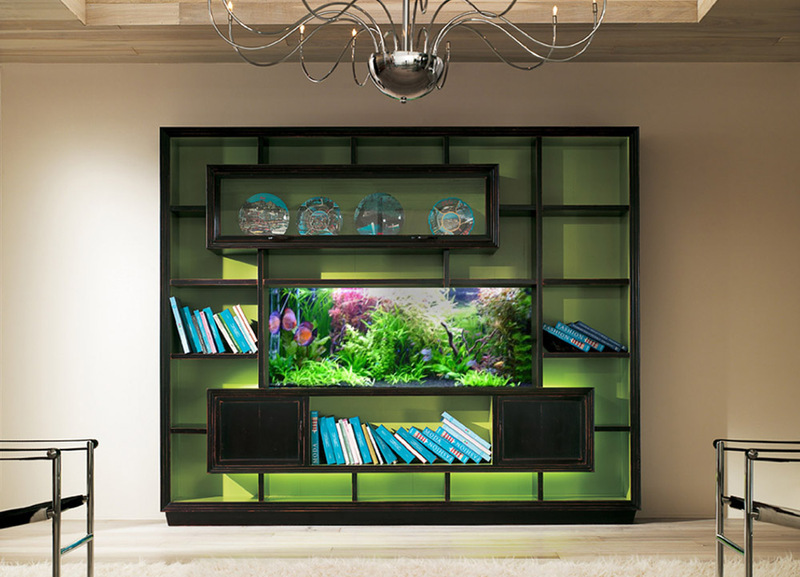 What I really like about this one is that it’s not rocket science, the maker just has a normal fish tank and they have clearly built a entire bookcase around it! Cleaver, yes! But also very simple to copy ourselves. There is a little touch of genius in these, as it is not only cool looking but also a great use of an older TV set that has blown and no longer in use! You just know there is a massive market for people to try and make their own and sell them. Recycling at it very best. OK, OK it is not actually inside the door. But it does give the illusion of it! And this old storage cupboard turned into a aquarium is a great idea especially when you use an old external door like this designer has done, and with the exposed brickwork it is nothing short of amazing. Nothing more says “CEO” than a office desk that is also a rather impressive aquarium! Although I have to say that it might well distract me from my work, if I had one it would probably mean I owned the company! So it wouldn’t matter what I did anyway. While it is very, very impressive this sofa / aquarium might not be the most comfortable thing you have ever sat on, with it’s hard edges I just get that feeling. But hey! 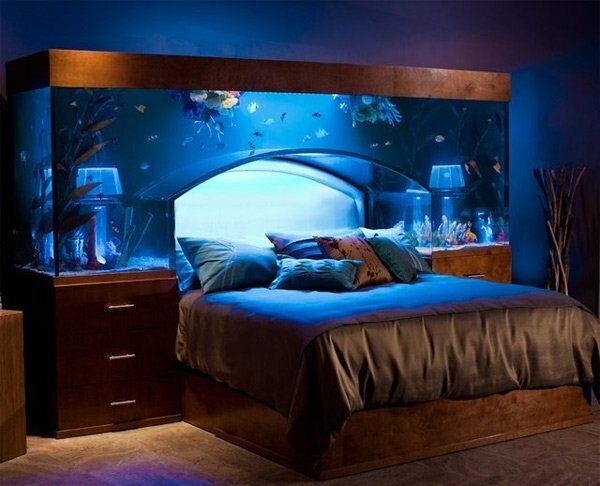 I might be wrong and in fact what you are seeing is the most amazing sit fish tank in the World! What better way to cover that boring old mantelpiece than to wrap an entire aquarium around it! Not only stunning to look at, but it also creates a real illusion on depth. WOW! That is just about the only thing I can say whenever I look at it! Well anyway, this overhead bedside cabinet does look impressive you might stay up all night thinking it was going to leak or maybe just stay up all night watching the fish swim over your head! Either way you are not going to be getting much sleep. I promise you! I really do like to look at aquariums, but this one that is built inside a toilet is going too far, while I did indeed make it number 1 for the sheer levels of the word “unique” it covers, I do think it is just a stage too far, but also kind of amazing all in one very oddly placed fish tank.